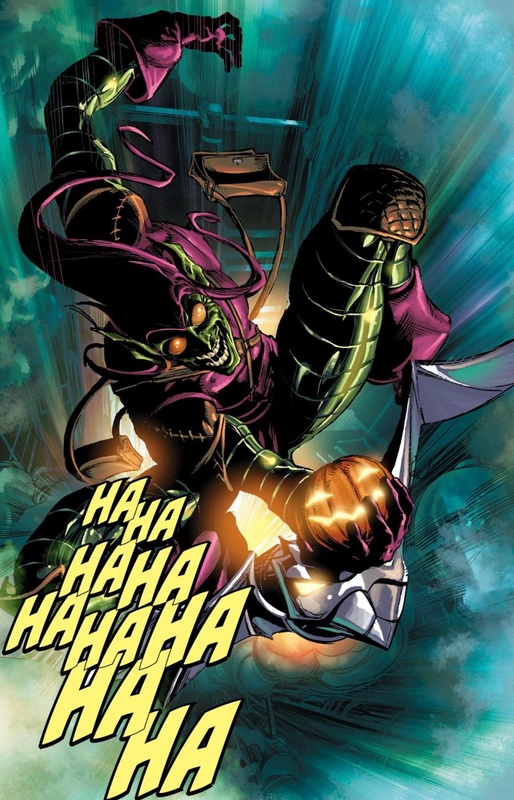 Come February, when “Goblin Nation” ramps up in Superior Spider-Man, I intend to feature a top 10 list of my all-time favorite Spider-Man vs. Green Goblin storylines. But while I make you all wait for this mysterious list, I thought over the next couple of weeks, I would periodically spotlight a couple of Goblin stories that either didn’t make the cut, or didn’t qualify due to some set of arbitrary rules I decided to establish and follow. 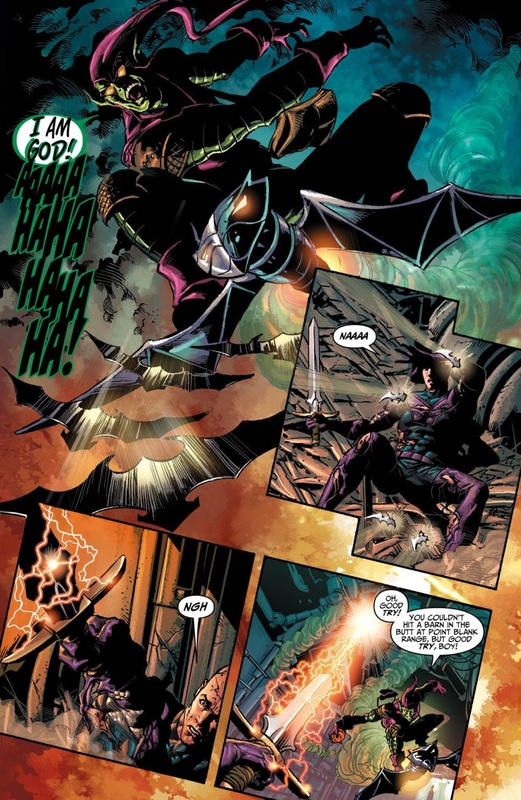 Warren Ellis’s 2007-2008 run on Thunderbolts, specifically the Norman Osborn/Green Goblin-centric issues #120-121, is an example of the latter. I’m not going to include it on my top 10 list because Thunderbolts is not technically a Spider-Man comic, nor is Spidey involved in any way (outside of Norman’s paranoid and delusional imagination). Because Spider-Man and Green Goblin have had many epic encounters over the years, and since “Goblin Nation” is being marketed as the next major showdown between the two characters, I thought it was apropos to keep my list focused strictly on stories involving both. I’m providing all of these disclaimers because in terms of sheer joy and brilliance, Ellis’s characterization of Norman in Thunderbolts #120-121 would unquestionably make the top half of my list if I focused purely on great Goblin moments. It’s just that good. If you haven’t read Ellis’s Thunderbolts stories, I give it the highest of recommendations. Crazily enough, if it wasn’t for a recent recommendation from one of my readers (and easy access to the issues via the Marvel Unlimited app), I don’t know when I would have ended up discovering the awesomeness of these issues. The Ellis-Thunderbolts issues represent two kinds of blind spots for me. There’s the Spider-Man comic blind spot – I was working a job in 2007-08 that made it very difficult for me to get to a local comic book shop on a regular basis, not to mention I really only had the time to read Spidey-specific stories, rather than an off-beat, dystopian “B” series about a group of villains and sociopaths, including Osborn and Mac Gargan’s Venom, working as tools of the federal government by chasing down unregistered superheroes in Marvel’s post Civil War universe. 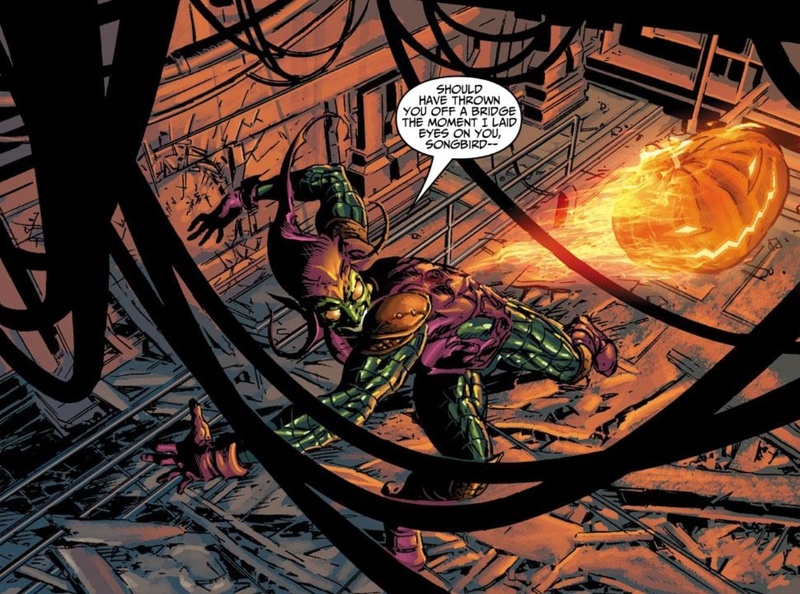 In hindsight, I think Ellis’ version of Thunderbolts is a great concept, especially for Osborn considering so much of his time and energy after returning from the dead during the “Revelations” Spider-Man arc was centered on him publicly disavowing his connection to the Green Goblin. 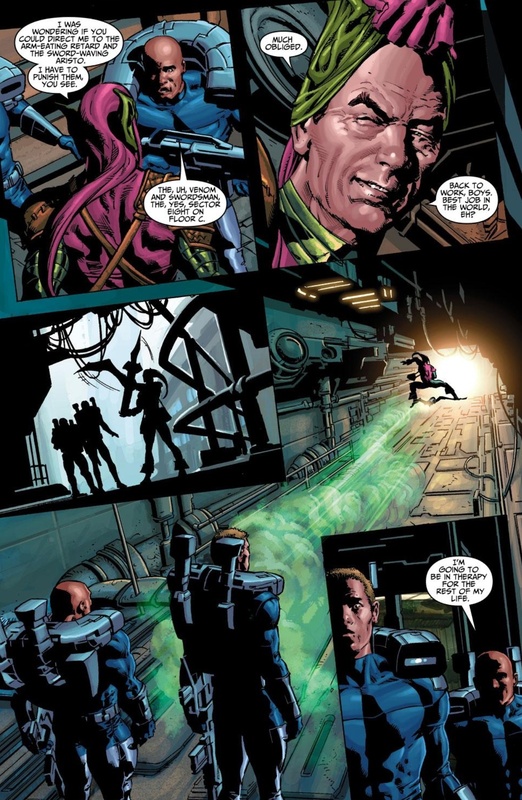 As head of Thunderbolts, Osborn was able to do a “public service,” while simultaneously stroking his ego and giving him the power he lusted for during his years as a businessman-turned-criminal overlord. Additionally, Ellis has long been a blind spot for me as a general comic book enthusiast. As some of you may note, I’ve contributed some articles in the past for the Sequart Organization and when I first started writing for the site, I noticed that there was a lot of love in that community for creators I was very familiar with, i.e., Neil Gaiman, Grant Morrison, Frank Miller and Alan Moore, and one I wasn’t closely aware of – Warren Ellis. The first Ellis story I read was his “Extremis” arc in Iron Man (which I read before seeing Iron Man 3 over the summer), but never got around to checking out some of his more off-beat work like Transmetropolitan and Planetary. I know, as a good comic book fan, I need to read these series at some point, and I intend to. But I just haven’t yet. When I started reading the Ellis Thunderbolts issues (which kicks off at #110) I was immediately taken by how dark these stories were. Not that I should have expected anything less from a series that focuses on (mostly) career villains, but considering the opening panel of Thunderbolts #110 is Bullseye telling Norman during his interview to get on the team that he had just killed a father and son for “fun” by using a popsicle stick, that part of my brain that no longer can find the “artistic merit” or “dark comedy” when it comes to depictions of violence against children, sounded the alarm and I wasn’t certain if this was the series for me. But I continued onward, and appreciated how Ellis handled Bullseye’s role on the team. He’s a wackjob that even his own crazy teammates can’t trust. He has very few moments of glory outside of paralyzing the unregistered Jack Flag, and is treated more as a looming ominous threat of just how evil the Thunderbolts are once you get past Osborn’s smiling, baby-kissing show for the public. Meanwhile, as the series progresses, Osborn is clearly becoming more unhinged – so desperate to be liked, yet so totally incapable of behavior that is even remotely virtuous. He takes a specific fascination of an unregistered hero Steel Spider (hmm… why would a “spider” hero set him over the edge?). But even with these hints and allusions to Osborn’s sworn enemy, Thunderbolts doesn’t actually need a Green Goblin vs. Spider-Man showdown to be a worthwhile read. 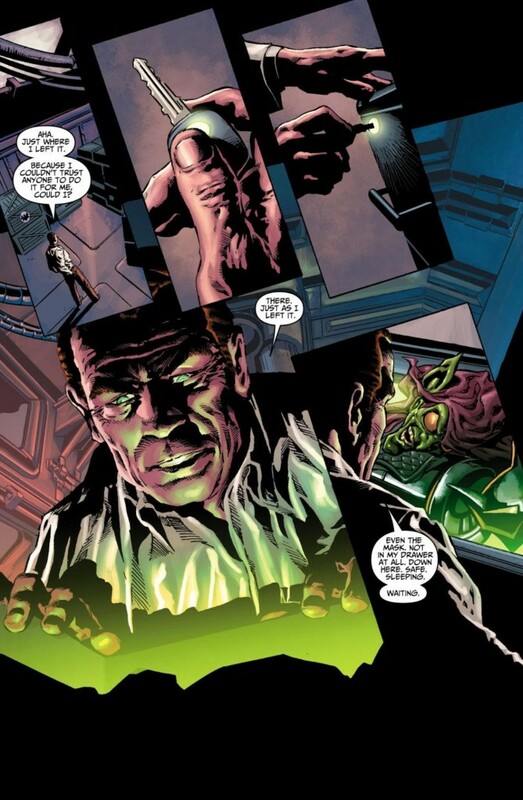 The whole spiel is truly a spectacle of the absurd, and in addition to being hysterically masterful, also manages to capture exactly how Norman Osborn has emotionally evolved from his original “death” in Amazing Spider-Man #122, to his eventual resurrection in ASM #418 (and return to prominence thereafter). Even when Osborn was playing out his maniacal plans in Spider-Man arcs like “The Revenge of the Green Goblin,” and “A Death in the Family,” he seemed to be exhibiting a modicum of restraint. Under Ellis’s pen, Osborn finally lets his freak flag fly, revealing just how highly he thinks of himself and how little sympathy or pity he has for everyone underneath him (or that was killed by him. Poor Gwen Stacy’s death and pregnancy via Norman both get alluded to in comical fashion during Osborn’s monologue). When Osborn flies through Thunderbolts Mountain screaming “I am God,” Norman believes this is the absolute truth. 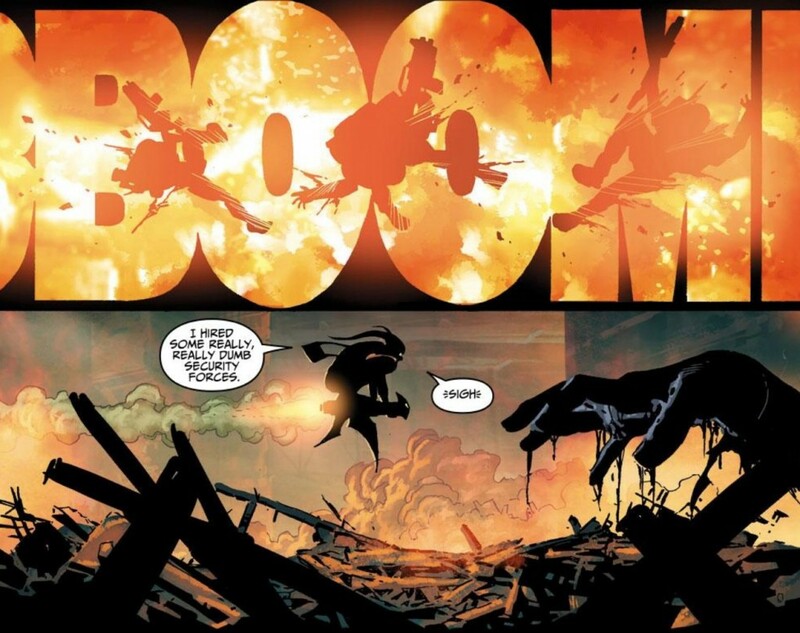 Once he’s back in his Goblin suit, Norman emotionally and physically torments everyone who gets in his way, capping off Thunderbolts #120 by dropping a pumpkin bomb in the hands of some security team members, blasting them to smithereens (and then bemoaning his team’s lack of intelligence in the aftermath). In Thunderbolts #121, Norman is confronted by Songbird, one of the original Thunderbolts members who still sees the team as having the capacity to do good in the post-Civil War world (and not pretend to do good in an effort to gain fame and sell action figures as Osborn desires). After watching Osborn cut his way through Thunderbolts Mountain like a hot knife through butter, I did find his battle and eventual defeat to Songbird to be anti-climatic, but it’s the only way Ellis can return Osborn to a place where he’s driven more by ego than id. In prior blog entries, I’ve talked about how Osborn’s modern era evolution into a Lex Luthor-esque evil businessman was never my cup of tea since I tend to favor the maniacally unhinged supervillain he is portrayed as during his major Silver Age stories. But during his run on Thunderbolts, Ellis manages to combine the best of both of these characterizations, especially in issues #120-121. The result is a rare instance where a comic book story outside of a Spider-Man title focuses on one of Spidey’s villains and, after I finish reading it, I can’t even imagine a scenario where the presence of my favorite hero would have improved the story one bit. 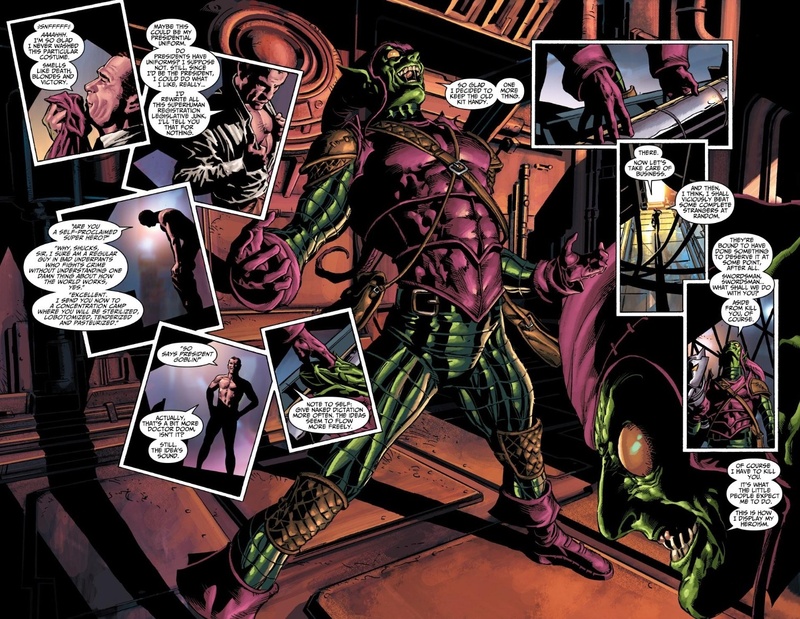 There’s obviously still a debate as to whether or not the man under the Goblin mask in Superior Spider-Man is an Osborn – as the clues that have been dropped so far make it seem too obvious that it’s either Norman or Harry. And yet, how could Dan Slott go wrong in bringing back this version of Norman if he intends to give his Superior Spider-Man the major blowoff I suspect he’s going to over the next couple of months? Good read – thanks for highlighting this run – never heard of it before! Oh gosh, you guys, this story. While I’ve moved from being staunchly pro-Norms to being more ambivalent about his ’96 resurrection, stories like these make it worthwhile. There’s really a lot going on for the character in this book, and it, like Jenkins’ Venom story, really defined him for the next few years. @E. Wilson: I’ll probably follow this up with more later, but I wanted to say that this story probably made you a fan specifically of Warren Ellis’s Songbird (hence your disappointment with follow-ups), because his Songbird bears little resemblance to the character appearing in the previous 100+ issues of the title. Warren Ellis’s Songbird is like the Superior Spider-Man to previous issues’ Peter Parker (but with no reason given for the change). Oh I love Osborn’s monologue here. Incidentally, I recalled a post where Ellis said that he could write a whole book of Norman’s villainous monologues. When you’re making out your top ten Goblin stories, don’t forget about Spectacular Spiderman #2 (the magazine) which came out in 1968. It wraps up a storyline that had been building in ASM over several months in which Norman was regaining his memories of being the Goblin. I think it might be ASM #66 in which Norman totally remembers everything and is shown putting the Goblin costume on. It it one of my favorite Spidey-Goblin stories and has great art by John Romita Sr. The story was reprinted in ASM Annual #9 which came out in 1973, but a number of pages from the original story were left out. If you haven’t read it you need to check it out! This is, bar none, my favorite Norman Green Goblin…anything. I don’t think his outfit has ever looked better either. Same color scheme, but with some real slick armor, and an absolutely terrifying mask. Notice how the panels on the left of the Goblin suit are kinda oft-kilter and crazy, and the ones on the right very normal. Being in that suit IS Norman’s normal…one of those little storytelling quirks you might not notice if you hadn’t read this story a million times like I have. This whole Thunderbolts run is a great read.